Sign and share the petition to the EPA to Ban Asbestos in the US Now, Without Loopholes or Exemptions. 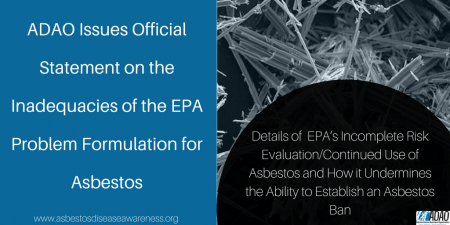 WASHINGTON, DC – August 16, 2018 – The Asbestos Disease Awareness Organization (ADAO), the largest independent nonprofit dedicated to preventing asbestos caused diseases in the United States, today issued a statement from President and CEO Linda Reinstein about the comments ADAO filed today on the Environmental Protection Agency’s (EPA) Problem Formulation Document for asbestos, the latest step in its tragically incomplete risk evaluation for this deadly substance. “It is now clearer than ever that EPA is turning a blind eye to the overwhelming threat that asbestos poses to the health of the US population. This problem formulation completes the single-minded effort of the ‘Trump EPA’ to narrow the asbestos risk evaluation to the point of ignoring nearly all the risks of asbestos in American workplaces, residences, schools and commercial buildings– undoing the decision of the ‘Obama EPA’ to use the reformed Toxic Substances Control Act to finally impose a much-delayed ban on asbestos use in the U.S., which now is virtually unregulated. ADAO’s Problem Formulation Document comments provide EPA with additional evidence that there is no safe or controlled level of use or exposure to asbestos. In our comments, ADAO outlines the many deadly exclusions from the EPA risk evaluation that make it essentially irrelevant to protection of public health, including: EPA’s failure to examine the dangers of asbestos’ pervasive ongoing presence in the built environment due to legacy products; its refusal to consider Libby Amphibole, a deadly form of asbestos once mined in the U.S. that is causing death and disease in communities near mining sites and putting at risk residents of homes with vermiculite attic insulation; its unwillingness to use TSCA to ban discontinued products permanently so that they do not return to commerce; its failure to take into account the known asbestos-related exposures and deaths from ovarian and laryngeal cancers, and asbestosis, and its refusal to consider risks of air emissions and asbestos waste, notwithstanding the 25.6 million pounds of asbestos that are disposed in landfills throughout the nation. “Asbestos is a known carcinogen, but imports continue. As Occidental Chemical Corporation reported, ‘Annually, the American Chemistry Council’s Chlorine Chemistry Division (CCD) member companies use an average of 440 tons of dry chrysotile asbestos to maintain diaphragm production at nine diaphragm- technology locations in the United States.’ The American Chemistry Council (ACC) touts that the Chlorine Industry has a “long history of safe use” however they exclude mining, importation, distribution, and disposal. “ADAO isn’t alone. Last week there was national and international outrage as seen in the nearly 500 public comments regarding EPA’s proposed Significant New Use Rule (SNUR). In addition, more than 20,000 people have signed ADAO’s petition on this important topic.